Heavy duty deck plate for use with piling hoop. 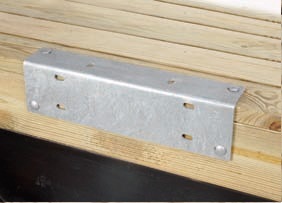 This 3/16" thick 4" x 6" angle can be bolted from the top and side of the dock. The hoop can then be bolted to the angle, allowing it to be removed seasonally. 22" long. Commercial grade.